We’ve heard many rumors about Apple planning to add one more model to its current iPad lineup. This new iPad is being referred to as the “iPad Pro.” It’s expected to measure somewhere in between 12.2 to 12.9 inches, meaning it will be larger than the iPads currently available. 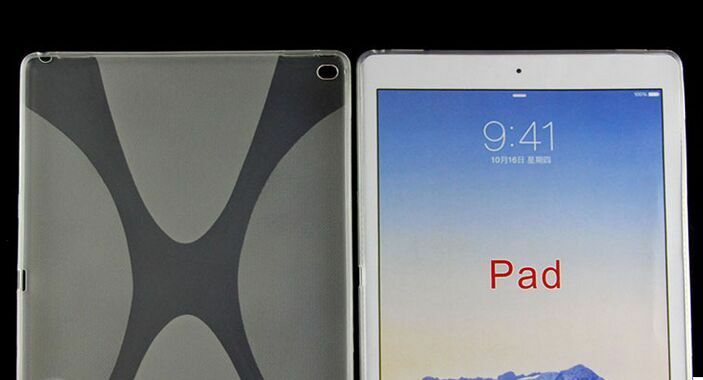 We’ve been able to get our hands on some cases that claim to be made for Apple’s new tablet. The iPad Pro seems to resemble the current iPads with the addition of stereo speakers that are located on the top and bottom of the device. None of its other components such as the iSight camera and Touch ID button seem to have moved position. We’ve heard rumors of the iPad Pro is being equipped with multiple ports just like some of the very early iPad 1G prototypes and as it seems the cases we have show that the iPad will in fact have two ports, one at the bottom of the device and one on its side. It’s still unclear whether they will both be Lightning ports or USB-C.